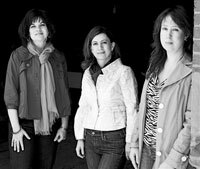 The critically acclaimed Calyx Piano Trio features Nina Ferrigno, piano, Catherine French, violin, and Jennifer Lucht, cello. All seasoned chamber musicians, the members of the Calyx Trio have given chamber music concerts throughout the United States and abroad, exciting audiences with their expressive ensemble playing and brilliant virtuosity. As individuals, they have performed with leading national ensembles including the Boston Symphony, the Boston Pops, the St. Louis Symphony Orchestra, and have been heard in chamber music performances at major festivals including Marlboro, the Banff Centre, Ravinia, and Tanglewood. In addition to being Trio in Residence at the Carolina Chamber Music Festival (2008, 2009), recent appearances include those at the Sheldon Concert Hall (MO), the James Library (MA) and the Skaneatales Festival (NY). The Calyx Trio presents dynamic programs featuring master works of the repertoire and fresh pieces by living composers. Committed to expanding the trio repertoire, the Calyx Trio has worked with organizations including the Barlow Foundation to commission and premiere new works.